"A Child's Home Coming on the Day Before Christmas"
In the mid-1870’s John Ellsler’s productions were going on tour. Although still a teenager, Joseph Haworth was cast as Laertes opposite Edwin Booth’s Hamlet. 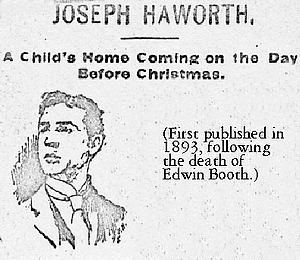 On Christmas morning 1877, the Hamlet company was traveling with Mr. Booth from Cleveland to Pittsburgh. A catastrophic accident occurred. Joseph Haworth’s written account of this train wreck was widely published following Edwin Booth’s death in 1893. Christmas is essentially an occasion of joy and merriment, but I have noticed from the time when at my mother’s knee, I made my first acquaintance with Christmas stories, that these incidents of the gladsome festival are frequently tinctured with so much sadness that the impression they leave is not easily effaced. The story I am about to tell is of this melancholy variety. I warn the reader in advance, so if he is a person whose appetite for the seductive Christmas turkey might be impaired by a pathetic narrative, he may turn to the pleasanter descriptions, which he will undoubtedly find from other pens in the Christmas Journal. While I was in the company of the lamented Edwin Booth we were traveling one Christmas morning on the express from Cleveland to Pittsburgh, where we were billed for Hamlet. The great tragedian was then in the very height of his success, holding his immense audience spellbound by his wonderful power, and achieving nothing short of a triumph in every place where we visited. I was an exceedingly young man then, not even past the boundary of my teens, and, as I had been assigned to fill the important role of Laertes in Pittsburgh, the magnitude of the task crowded my heart with a nervous fears, which did not diminish a particle while we sped along our journey, gradually nearing the city where I was scheduled to make my trembling debut as the brother of the unfortunate Ophelia. Neither the rumbling of the car wheels nor the chatter of my histrionic companions in adjoining seats could divert my mind from Laertes. I was particularly concerned about the duel scene, looking forward to facing the eminent actor in mortal combat with the same degrees of trepidation that is experienced by the small boy, who has been invited by his stern teacher to stay after school to taste the stinging qualities of his ferrule. The man who inspired me with all of this worry was sitting in the smoker ahead of our car, contentedly puffing his pet pipe, his thoughts probably a thousand miles distance from either Laertes or Haworth. Swiftly the train rolled on its journey. Now it approached a station about 20 miles distance from Pittsburgh. We were commencing to slacken our speed when suddenly there was a shock which rudely interrupted my contemplation of Laertes, knocked my nervous fears into smithereens, and incidentally hurled me against the seat in front. Our car launched from side to side, with difficulty retaining its position on the rails. Consternation was the immediate and general result of this disturbance. The passengers, all of whom like myself had been forced to part company with their seats, showed by their blanched countenances the mental distress they were undergoing. As soon as everybody was satisfied that no bones were broken, there was a universal desire to know what had caused the shock. To satisfy the curiosity, we left the car, which had made no effort to proceed since the accident. A rapid survey of the scene left no doubt as to the origin of our trouble. Our train had been smashed into from the rear by another express, which on account of a misplaced switch had dashed on our track and had collided with the last car of our train before the brakes had performed their duty. The last car, shattered and derailed, was quickly surrounded by the passengers from the other cars. It lay on its side, a shapeless mass of broken wood, glass and iron. Heartrending shrieks issued from the ruins, proving all too plainly that the passengers of the ill-fated car were imprisoned there. As long as I live I shall never forget the groans of those poor sufferers and their piteous appeals for assistance. It was not a time to idly stand with awe-struck countenances. The work of rescue had to be commenced and quickly too. All of the male passengers cheerfully lent their aid to the train hands with so much alacrity that in less than half an hour, 15 victims of the calamity, some dead, some dying, and others only slightly injured, had been removed. This was supposed to constitute the entire number of passengers on the last car, and we were about to abandon our search when a feeble moan came from a pile of splintered timbers at the end of the wreck. Hastening to the spot, and clearing away the debris, we beheld a sight, the recollection of which even now brings a tear to my eye. A little girl, not more than 9 or 10 years old, was at the bottom of the heap; her delicate body pinioned and crushed by the cruel timbers. She was dying. Her breathing was slow and faint, and her fair face, framed by a cluster of golden ringlets, wore a pitiful, Oh, such a pitiful expression, that the horrible recollections of the other victims were dwarfed by comparison. It was a picture of a young soul, agonized by moral torments, on its way to a blissful eternity. One moment her suffering was so intense that her pretty features were distorted. Then they would wear a look of eternal peace as if her pure spirit was already catching a glimpse of Paradise. While the struggle between life and death was continuing I bent over her to ascertain something regarding her identity. "My child," I whispered, "who are you? Where were you going?" The first question evoked no response, but as the second was asked her lips trembled and formed themselves to make reply. I bent still lower to catch her response which came slowly and almost inaudibly. "I am going" – there was a long pause, during which all traces of mortal agony passed forever from her countenance, leaving in its place a seraphic light. "I am going" – There was a last tremble of the lips, a last flutter of the eyelids- "home." As I turned my head from this sublime spectacle, I beheld a figure at my side, with head bowed low upon his breast and tears, trickling down his cheeks. It was Booth. "Indeed you have gone home, you angle child," I heard the great tragedian say, "and may God keep you in His arms for all eternity." A solemn amen was echoed from all our hearts."